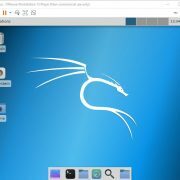 The Kali Linux, Debian-based Linux operating system known for its penetration testing capabilities. 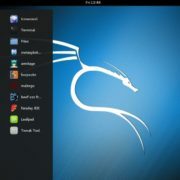 There are lots of tools on Kali Linux those are pre-install and used for ethical hacking or testing purpose as I said. But when it comes to office productivity applications then you need to install them manually such as LibreOffice or Apache office those are open source. However, these are not alone office suite software, there is one free alternative available with functionalities like Microsoft office called WPS office. 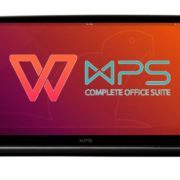 The WPS office is one of the best office suites which is available in both free and premium version for multiple platforms like Windows, Linux, iOS, and Android. Just like the Microsoft office suite, it also has WPS Writer, Spreadsheet, PDF reader, and Presentation. It supports all old and new Microsoft office extensions such as Word (97/2000/2003/2007/2010) .doc, .dot, .docx, .dotx, .docm, .dotm, .xml, .rtf; Excel (97/2000/2003/2007/2010) .xls, .xlsx, .xlsm, .xlt, .csv, .xml, .html; PowerPoint (97/2000/2003/2007/2010) .ppt, .pptx, .pps, .ppsx, .pot. This software really makes easy to handle the different office documents on the fly without struggling with their extensions or compatibility on Linux. We already did an article in which we mentioned how to install the WPS office on Ubuntu. Please have a look at it. Now, here we give the step by step tutorial to install the WPS office on KALI Linux 2018. Now according to your KALI Linux version download the 32-bit or 64-bit WPS office. For 32-bit KALI Linux click on the i386.deb and for 64-bit choose the amd64.deb. Open the command terminal of the KALI Linux and type ls. When you type ls, it will show all directories available under your home user. Under the Downloads directory, you will find your downloaded WPS office .deb file. Just copy the name of that using mouse and pressing the right click of it. 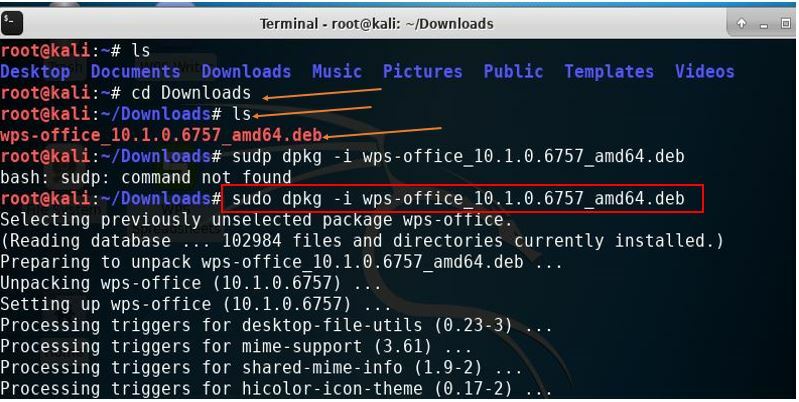 The main command is sudo dpkg -i followed by the name of downloaded WPS office .deb file. You can either write it manually or just copy paste it using the mouse and then press enter. 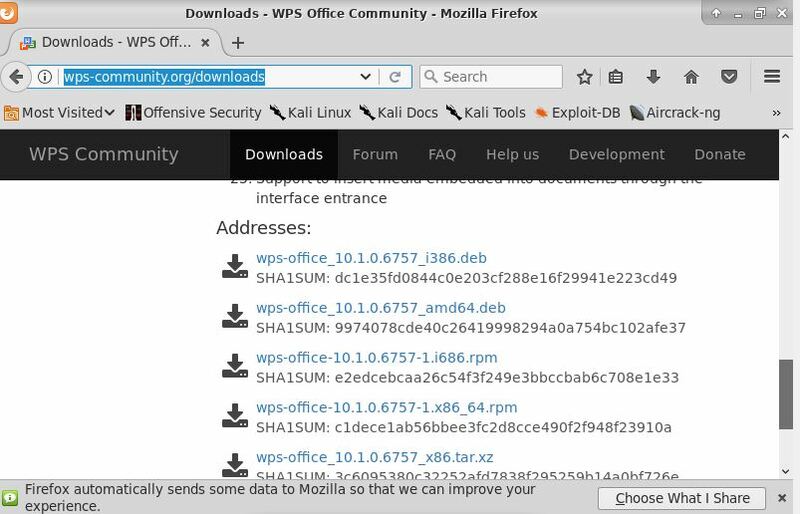 As soon as you press enter, the WPS-office suite will install on your KALI Linux, simply. 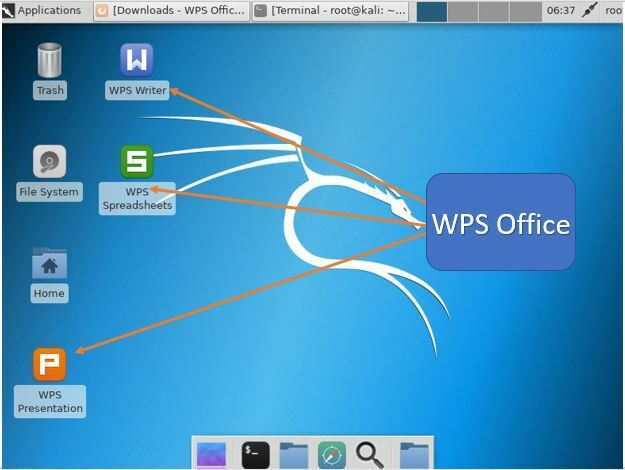 Once the WPS office installed you will see the shortcut icons to WPS writer, WPS spreadsheet and WPS presentation on the screen of your KALI Linux.